Swimbladder problem Hello Jorie, Mary here,<Hi Mary, MacL here with you this time.> Well lets see he was fine all last winter, and when spring came I put my comet into our water feature outside. He even spawned with the other comet that I saved. Two weeks ago he came back inside and was put into my aquarium. I did a water change before he was brought in, about halve. All of the other koi and goldfish are doing fine. He will stand on his head, swim sideways swim upside down, swim in circles very fast. 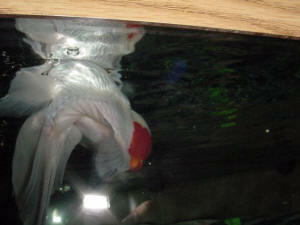 He makes frequent trips to get air and belches large amounts of air bubbles. Once in awhile he will right himself. Like I said all of the other fish are doing fine. I hope this helps in your diagnosis. He is three years old and I hate to loose him now. <I bet he sure sounds lovely.> <Mary, I'm sure you have already tried the frozen pea remedy to be found on the site and possibly salt. The other option is to try to try feeding your goldfish sinking foods rather than floating types. They won't inhale so much air this way. The pellets if soaked in water before feeding will expand before the fish eats them and this has helped a lot for some fish I have seen> Thank you so much for writing me back, can you help? Again thank you, Mary. 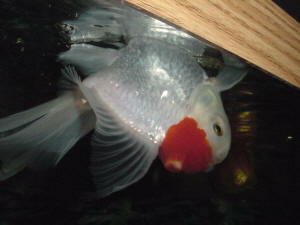 Problem for about 6 months goldfish I have been to the WetWeb website. Unfortunately, I did not find anything on there like how my goldfish is. I found some things you could try like peas, Epsom salt, and medication. I have tried those things and they haven't worked. Did you download my pictures to see what he looks like? Please let me know. < Sorry didn't get the picture. 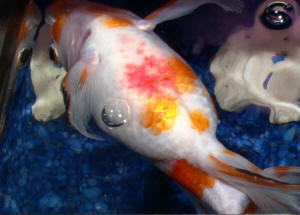 But I sense that your goldfish may be bloated or look like it is ready to pop. If this assessment is correct then you need to treat your fish with Metronidazole for internal bacterial infections. Follow the directions on the package. If you fish is eating then you have a better chance of saving it. -Chuck> Thank you.